Cruise routings of multiple-day, luxury Rhine River boat cruises can be extended by adding the Moselle, Main, and Danube Rivers in Germany. 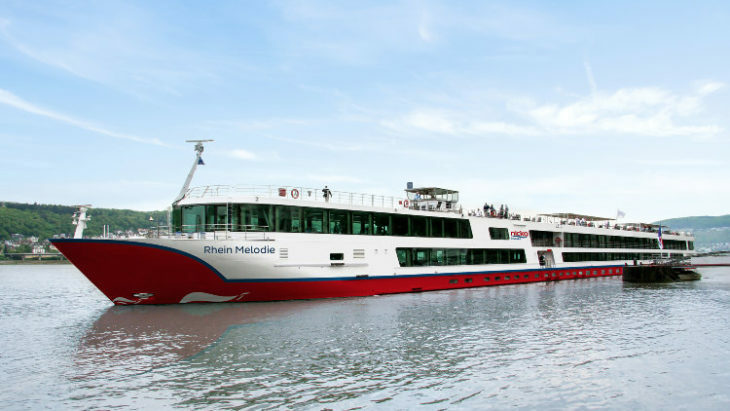 The Rhine (Rhein) River is enormously popular for both day trips and multiple-day cruises. Luxury European riverboat cruise liners such as Amadeus, Viking, Tauck, Avalon and Nicko cruise the Rhine both on the classic full Rhine route as well as by adding Rhine tributaries to form more interesting itineraries. It is even possible to cruise from the Rhine to the Danube basins by using the Main-Danube Canal. The classic Rhine River cruise is along the full length of the navigable part of the Rhein. Cruising from Basel in Switzerland to Amsterdam in the Netherlands can easily be done in four days (and five days upstream) but most modern-day luxury riverboat cruises are longer and stop more often (and longer) en route. Cruises are often a week but up to ten days are possible. The most popular and most beautiful part of the Rhine Valley is the Middle Rhine from Rüdesheim to Koblenz. This is the Rhine River of ancient legends and sagas. Here the Rhine Valley is the narrowest with steep banks. Main attractions include the Loreley Rock, endless castles, and small wine villages. The Middle Rhine is on the UNESCO World Heritage list. Further north, the Drachenfels (Dragon’s Rock) near Bonn also provide dramatic natural scenery. The city skylines of Cologne with its huge Gothic Cathedral (Kölner Dom) and thoroughly modern Düsseldorf are both memorable. The meandering Mosel (Moselle in French) is in a steep valley often as dramatically beautiful as the Middle Rhine. Trier, Germany’s oldest city with huge Roman monuments, is near the borders with Luxemburg and France. The attractions of the Moselle River are similar to those of the Middle Rhine: half-timbered wine-trading villages, medieval-look knights’ castles (e.g. Cochem), and endless vineyards. Burg Eltz – an authentic medieval fortress and arguably the best-looking castle in Germany – is near the Mosel and with the Marksburg along the Rhine the only truly authentic medieval castles in the region. The Main is another vineyard-lined German river. It has a wide valley and the Main cuts several very wide s-bends through Central Germany. Frankfurt am Main has the only modern skyscraper skyline in Germnay. Other attractions include Würzburg with its UNESCO World Heritage listed Residence, half-timbered villages active in the wine trade, and Bamberg with its UNESCO World Heritage listed old town and cathedral. The Main-Danube Canal links the Main River from near Bamberg via Nuremberg (Nürnberg) with the Danube (Donau) River at Kelheim. UNESCO-listed Regensburg with a great medieval town center and nearby Valhalla are popular stops along the Danube. Passau, at the German-Austrian border and the confluence of the Danube and Inn Rivers, is a very popular departure port for Danube River cruises, especially ones going downstream into Austria and Hungary. Luxury riverboat cruise lines cruising on the Rhine and tributary rivers include Tauck World Discovery, Viking River Cruises, and AMA Amadeus Waterways. Discounts and special deals are often available on European riverboat cruises but compare rates as boats vary widely. European cruise companies such as Nicko, Arosa and CroisiEurope that often do not actively market internationally may offer cheaper cruises but in less luxurious boats and with fewer excursions and services included. Dreamlines is the largest German cruise specialist and often has a large variety of cruises and deals on offer.